I’ve been wanting to try a CSA for years. I’ve been a member of Boston Organics on and off for the past several years, but while the items they provide ARE organic, I still struggled with the distance from which my food traveled to get to me. Much of the produce came from the far reaches of South America and from across the country. Was this REALLY eating green? I’m not so sure. It IS healthy for your family… but what if you could get produce that is BOTH organic AND local? That’s where the CSA is perfect. I did some research… and being late in the game to sign up (most folks sign up over the winter), my choices were a bit limited and my pick-up locations were as well. I live in West Roxbury and it seemed that the closest pick-up location (for many farm CSAs) is Jamaica Plain. JP fills up fast… no spots were left anywhere. I stumbled upon Red Fire Farm in Granby, MA and noticed that they had added a new pick-up location this year… in West Newton. As luck would have it, this new location still had spots left. I pounced. While it’s not the most convenient location for me, it works. It’s about a 15-20 minute drive (about 5 miles — this IS the city after all) and the pick-up time is between 4 -7pm. 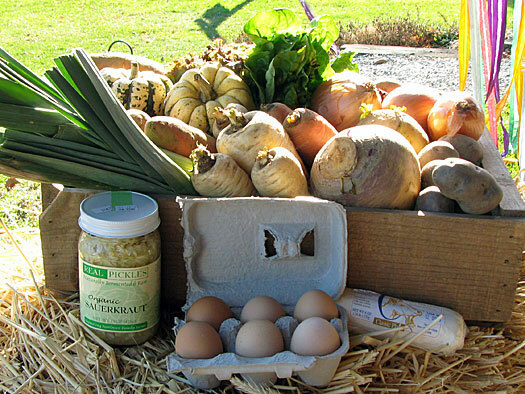 You get an email early in the week (from the farm) listing out the possible options for this week’s “Share”. Some pick-up locations vary in what options you get. The way it works, is you arrive at your designated pick-up location. You see the coordinator, who checks your name off the shareholder list. You look at the whiteboard, which tells you how much of each item you can take. They provide plastic bags and a scale for the items that come loose and need to be weighed. You’re supposed to bring your own carry-away bags. You navigate your way through the crazy crowd, trying to get all your items and get the heck out of there as quickly as possible! Who KNEW so many people participate in these things!? While I admit I’ve had to compost a few things… especially the loose greens, we’re TRYING to incorporate these items into our weekly menu. Slowly but surely, I am striving toward being more organized with this. One thing I DID make — which is always a huge hit — was one of my FAVORITE summer salads: Bok Choy, Green Onion and Bean Sprout Salad, with toasted ramen noodles, slivered almonds, sesame seeds and presented in a sweet soy dressing. We also LOVED the Hakurei Turnips and ate them most nights in our salad. They have a very white, crisp flesh (almost like a radish) and have a light bite to them. Even the 5-yo liked them. Check back soon for what we get tonight and to (hopefully) find out what I plan on doing with them!